The Sikorsky SH-3 Sea King was an amphibious anti-submarine warfare (ASW) helicopter developed for the US Navy in the late 1950s. Powered by two turbine engines, this aircraft would be the first capable of performing the hunter (search) and killer (destroy) missions with a single aircraft. 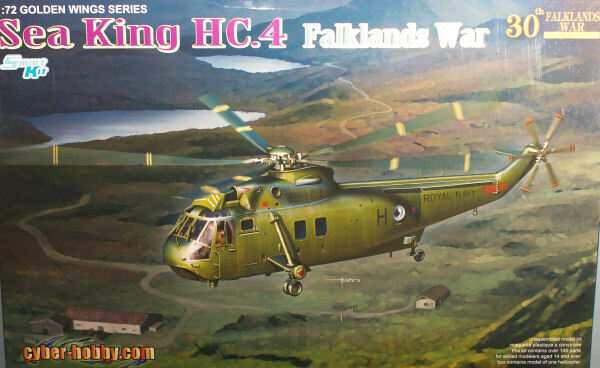 The airframe was very flexible and the Sea King would also serve in the search and rescue as well as the utility missions not to mention retrieving manned spacecraft that splashed down in the ocean. The aircraft was license-built by Westland for service with the Royal Navy and RAF performing similar missions as their US counterparts. The Royal Navy has also developed some unique configurations of the Sea King, most notably the AEW.2 which serves as the AWACS for their carriers. The British Sea Kings saw combat in a number of wars including the Falklands where they guarded the fleet from submarines, flew troops and supplies to shore, and even acted as Exocet decoys. The kit has some very nice detailing from the equipped main cabin to the interesting main rotor options. 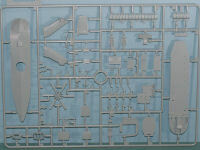 In this kit, there are two sets of main rotors, both with droop molded into the parts. In one set, the droop is molded downward simulating the doop of main rotor at rest and these are used in your choice of folded/stowed or unfolded. The other set is drooped upward simulating the aircraft in flight with a heavy load. The instructions didn't provide any information on the six aircraft provided in this set, there is instead a leftover identification from a WW2 subject left by mistake. 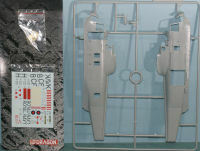 The instructions do provide painting and decal placement instructions for the Sea King. This looks to be one of the nicest releases of the Sea King in this scale to date and it will be interesting to see if DML produces other variants of the Sea King in either British or US configurations. My sincere thanks to DML for this review sample!